Cliff hanging suspense and thrilling action, Club Literacy students will participate in literacy building exercises and match wits with Nancy Drew, helping her solve a classic “Who Done It” mystery. It is no mystery (research proves it) that reading literacy of interest is one of the best techniques to improve young reader’s literacy skills and impart the love reading. 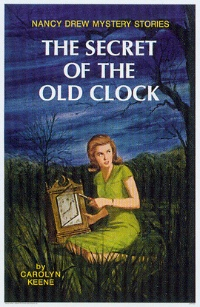 The Nancy Drew series is one of the world’s most popular mystery series for young readers ever, having been shared by MILLIONS of fans for generations. We will be reading an original Nancy Drew novel. The original versions are a higher reading level than later spin-offs. For the home assignment, it is ok for parents to read to or with your child for this book club. We will also learn about ghost writers and how the series was developed.